A Driving Force: Cranbrook and the Car explores the ways in which Cranbrook has played a role in the automobile industry since the start of the twentieth century. 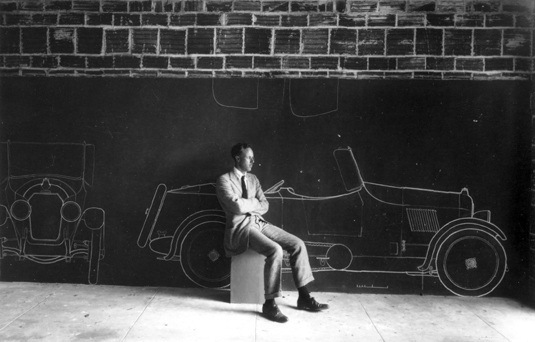 Looking at figures such as automobile designer James Scripps Booth and Cranbrook Academy of Art graduate Suzanne Vanderbilt, the exhibition highlights how Cranbrook has helped to define the ultimate symbol of modern America: the car. A Driving Force was organized by the Cranbrook Center for Collections and Research and curated by the Center’s 2012-2014 Collections Fellow Shoshana Resnikoff. The Center, which includes Cranbrook Archives, is supported, in part, by its Charter Patrons, the Towbes Foundation of Santa Barbara, California, and the Fred A. and Barbara M. Erb Family Foundation.